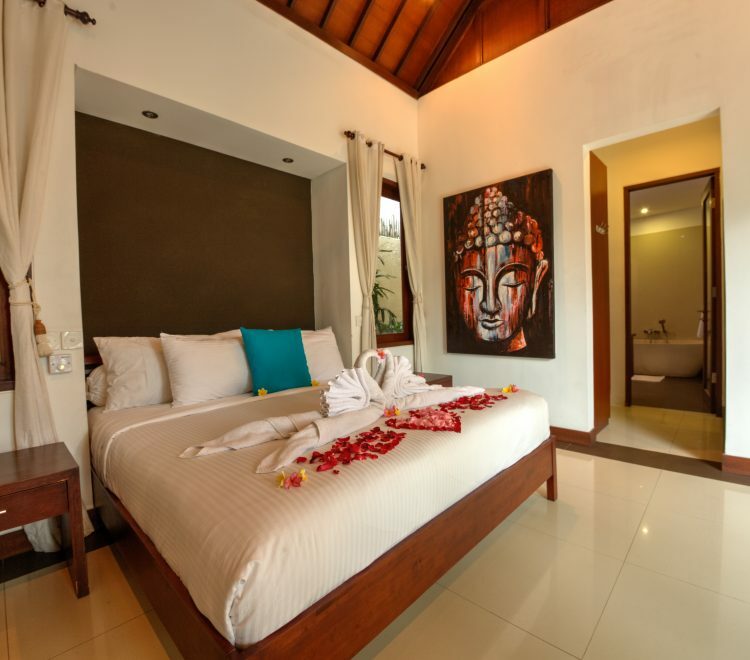 Rumah Raja offers travelers luxury villa accommodation. From the moment you walk into Rumah Raja you’ll know you’re in for something special. Located in the Seminyak/Umalas area, amongst the rice paddys and out of the way of the hustle and bustle of Seminyak, Rumah Raja is just five minutes from the beautiful Canggu and Echo beach. Although we are not in the center of Seminyak, our guests love having the convenience of being central to both Seminyak and Canggu and are surrounded by the culture of residential Bali. Just having gone through a full renovation Rumah Raja boasts complete luxury with three king size bedrooms, a personal butler, a private swimming pool, manicured Balinese garden, elegant living and dining spaces, a masseuse on-call, sumptuous in-villa breakfast and in house babysitting. Each of the 3 luxury bedrooms lead on to the private pool deck and are complimented by full ensuite with marble bath and rain showers, Plasma TV’s, DVD Players, Safety deposit boxes, built in wardrobes and air-conditioning. Rumah Rajas kitchen, dining and open living are all open to the garden and pool area, creating a wonderfully tropical indoor/outdoor living space. The large oversized custom built couch is a great place to sit and relax day or night; have a pedicure whilst you relax after your breakfast or our butler can make you a cocktail or serve you an ice-cold beer at the end of the day. The villa is close by to the famous potato head and W hotels. Our staff can book a taxi or arrange scooter hire for you. If you would like your fridge stocked with water, bintang or any other drinks please let us know upon booking and our staff can arrange this for you. Thank you all so much for the great stay, fabulous cocktails, melting messages, delicious breakfasts, freshly made beds, all your beautiful smiling faces and all your continuous efforts to make our stay pleasurable and memorable. Just wanted to thank you for the excellent service you provided; will definitely be returning to your villa and have passed your details onto our friends in Sydney.